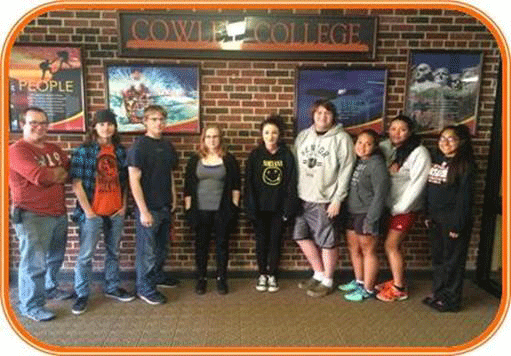 Students from Cowley College participated in the International Cosmic Day (ICD) event held November 2-4. ICD enables students to contact particle-astrophysicists to get insight into their research, experimental methods and everyday work. The students began by learning about cosmic rays, where they come from, how they can be measured, why it is important to study them and what effects they can have on our ever decreasing size of electrical systems and biological systems. The students were introduced to a working cosmic ray detector and allowed to design an experiment suggested by ICD so they could collaborate with other students around the world. They chose to look at the effect the incoming angle of cosmic ray particles have on their overall rates. After pointing the detector starting at 90 degrees North and collecting cosmic ray muon rates for 10 minutes, they changed their viewing angle by 15 degrees upward, and collected data until the detector was at 0 degree Zenith angle and continued to 90 degrees South. The results were analyzed and determined to show more cosmic ray radiation coming from directly overhead than from the horizon. The students participated in video Skype conferences with European and United States groups on November 5. They created documents to share with other schools, and will have their results published by CERN institutions. Physics instructor Martin Shaffer was the moderator during the United States Skype session. Those pictured are: Brad Ingram— Engineering Major; Ian McMains— Engineering Major; Quentin Noland— Engineering Major; Anna Aspinwall— Engineering Major; Jenna Pfaff— Pre. Veterinary Medicine; Aaron Hein— Computer Science Major; Cristal Marquez— Sonography Major; Karla Crispin— Sonography Major; and Jessica Ramirez— Engineering Major.